After I took a Moroccan cooking class, I learned the Hummus is so easy to make fresh at home. The best part is that you can control the ingredients that go into it. Add all the ingredients into a blender. Then blend for about 10 minutes, or until it is smooth. Add more olive oil or lemon to taste. Drizzle a little olive oil and sprinkle some harissa on top before serving. Serve with homemade pita chips! You can find the recipe for the pita chips at OC Family Magazine! This looks so good...I am making this! Thanks!! It is so easy - healthy - and delicious! Oh YUM! I love hummus with carrot sticks! You are right! Carrot sticks are the best with hummus! Are you on a Mediterranean kick? I love all of these recipes! The half of me that is Armenian is trying to attempt to grab my keys so I can go buy the ingredients immediately! And I pay Trader Joes for that?? I might have to grow my own chickpeas too. Now I have to Google that. I know! 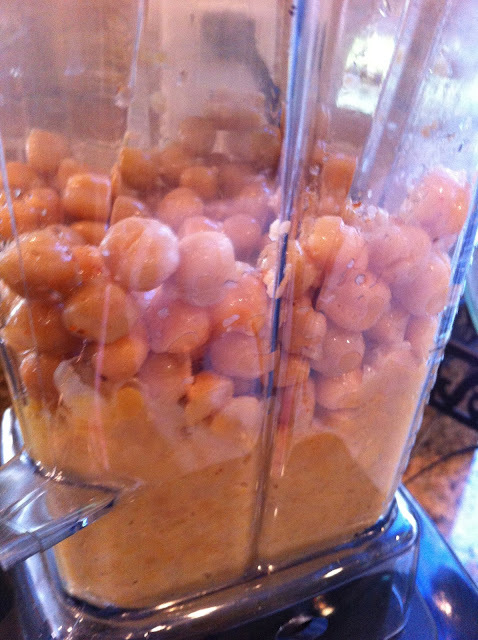 The benefit is that you know exactly what is going into your hummus that is made at home. Yum and yum. I love hummus. I haven't made it in ages. You've inspired me. I just wish it weren't 11 at night! I know I'm probably like one of the few people who doesn't like Hummus but it looks good!